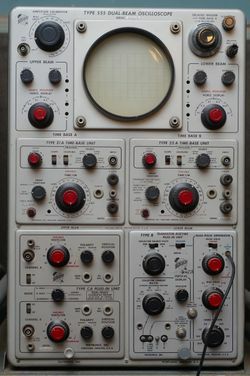 The Tektronix Type 555, nicknamed "Triple Nickel", is a dual-beam CRT oscilloscope introduced by Tektronix in 1959 and made until the late 1960's, when it was replaced by the 556. The system is split across two cabinets, the main indicator unit and the external power supply unit. The power supply unit contains the main transformer, rectifiers and regulators for all of the voltages except the filament and CRT HV supplies. The filament and CRT HV voltages are generated in the 555 indicator unit. The 555 uses special horizontal plug-ins that contain the trigger and sweep. Early instances of the 555 came with the 21 and 22 horizontal plug-ins. A rigid plug-in extension for the timebases (part number 013-013) was included with every 555. Later instances came with the 21A and 22A horizontal plug-ins, which use tunnel diodes for triggering. Delayed triggering is supported. Since the 555 is a dual-beam scope, it is also possible to start one of the sweeps while the other beam is sweeping. The upper-beam sweep and lower-beam sweeps are, in fact, totally independent. Regulation of the filament supply happens as follows: There is a feedback loop that is formed between the indicator unit and the power supply unit. The power supply sends AC through the interconnection cable to the indicator unit, where it is connected to the primary of the filament transformer. A sample of the output of the filament transformer is sent back through the interconnection cable (part number 012-032) from the indicator unit to the power supply unit. This performs two functions. First, the filament voltage that is sent back to the power supply unit is used to heat the cathodes of tubes in the power supply unit. Second, this filament voltage is the feedback signal to a regulator in the power supply unit that controls how much voltage is sent to the filament transformer. One of the consequences of this scheme is that it is impossible to energize the power supply unit without the indicator unit connected. The regulator tubes in the power supply would remain cold without filament power, and would not pass any current. The Tektronix 555 has a six-section differential distributed vertical output amplifier made of 6DK6 tubes. It is the same as the vertical output amplifier inthe 551 and the 545A. An L-C delay line is between the vertical output amplifier and the CRT vertical deflection plates for each channel. Architecturally, the 555, with its four plug-ins, is similar to the 7844. Rectification and voltage multiplication is performed by a total of six 5642 rectifier tubes. Each of the two HV power supplies is independently regulated using a two-stage common-cathode amplifier based on a 12AU7 dual triode. The oscillator tube is a 6CZ5 power pentode. The 555 uses the T5550 CRT.